The Bulls shot 51.3 percent overall and were a sharp eight of 19 on threes. This was going to be Bobby P's season. Finally, he had a role, a position, a regular job after even a year before he was out of the rotation, almost out of the game after his preseason fight with teammate Nikola Mirotic. But Bobby persevered, accepted the consequences, remained reserved off the court and aggressive on the court, and it resulted in even a leadership role as captain of the reserves, career highs in scoring, rebounds and shooting. Portis was feeling so good he even decided to bet on himself by rejecting an eight figure Bulls contract extension offer before the season. So when he saw media preseason predictions and some selected teammate Jabari Parker for the Sixth Man award, Bobby had some fun with reporters. "Don't do me like that," Portis said with a welcoming laugh way back in October. "Sixth Man. That's mine." That was, unfortunately, knee, ankle and elbow injuries ago, more games missed for injury than any Bulls player other than Denzel Valentine, Bobby's big bet looking like it was coming up craps. He often was looking like that as well, out of sync, behind plays, slow getting off the floor, and unusually quiet off it. But he just kept coming and coming, and perhaps with 26 points in the Bulls 105-89 victory over the Miami Heat Wednesday, Bobby is back. "I'm not that type of guy to say that," Portis said with a laugh in the rare, lighthearted Bulls locker room. "You can say that if you want. I'm just a guy who loves playing for the Bulls; loves putting the jersey on each and every day." And wearing it proudly again in the kind of play Portis and the Bulls expected this season, Portis' energy and effusiveness carrying the Bulls through the toughest part of the game with 15 of his 26 points in the fourth quarter, including 13 of the Bulls first 14 points of the quarter. Portis' run, combined with a vital three late in the third quarter, turned a 71-67 Bulls lead with less than two minutes left in the third quarter into a rare Bulls fourth quarter blowout. Against the 24-25 Heat who beat the Bulls by 14 in Chicago earlier this month. And in the second of a back to back after arriving in Miami from Brooklyn around 4 a.m. And with lead scorer Zach LaVine out with a sore ankle. The Bulls, nevertheless, got their second win of the month to raise their record to 12-40. They had lost four straight and 14 of 15. "You saw the normal Bobby," said Lauri Markkanen, who continued his assault on the boards with a game high 13 rebounds, averaging almost 16 the last three games. "That dawg who has that swagger when he plays; you saw it on the scoreboard." Markkanen added 14 points with a team most seven free throw attempts despite shooting four of 15. 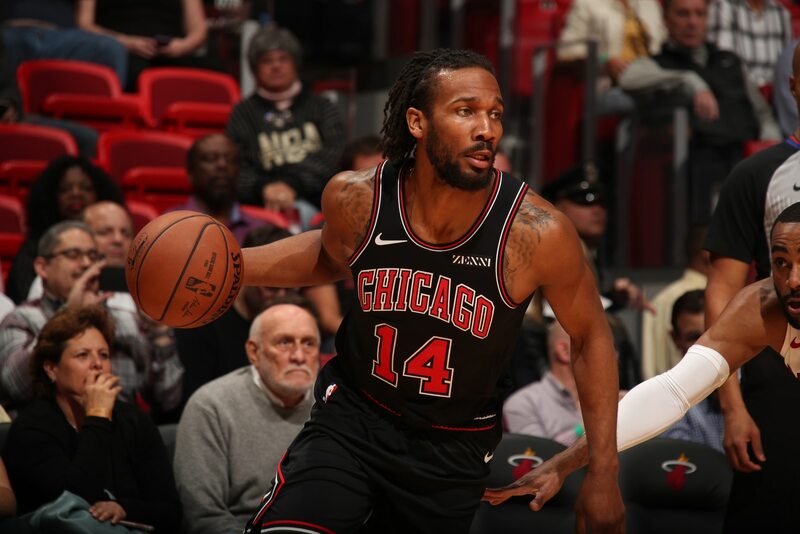 Kris Dunn rebounded for 14 points, eight assists and five rebounds, Robin Lopez added 13 points with nine in the first quarter to get the Bulls off to a 31-21 start, and Wayne Selden had a season-high 20 points. The physical shooting guard acquired in the Justin Holiday trade with Memphis is averaging 13.7 points and 58 percent on threes in the three games starting for the injured Chandler Hutchison at small forward. "Wayne Selden is a tough kid and he has the physical tools to play at this level defensively; you need someone to step up and guard that wing position and he's done a great job of it," said Bulls coach Jim Boylen. But with LaVine out with a sore right ankle and Jabari Parker with a sore elbow that helped hold him scoreless and to 14 minutes playing, it was Portis who came through, 26 points in just over 24 minutes in the difficult back to back on the road. "The thing about Bobby is he takes ownership of his play, good or bad," said Boylen. "He's had the ankle, elbow and knee in the same season. Over even three years you'd usually have one of those. That says a lot about his mental toughness, his makeup and his competitiveness. Bulls across his chest means the world to him. It's always fun when guys like that have success. I don't think he was so quick to shoot his three ball. He was playmaking from the top, dribble handoff and doing things in our offense that would make players around him better rather than shooting threes from off the bat. When you have that unselfish heart and mindset it comes back to you and it came back to him." It's been a long time in hibernation for the 6-11 bear of a man who likes to bear down. Portis had embraced his reserve role and seemed primed for a special season, a double/double with 20 points and 11 rebounds in the season opener and averaging a double/double through the first three games before he came limping off in the fourth game with a sprained knee. That cost him 23 games. He played five, then missed seven more with an ankle injury, played three and then missed another with an elbow injury. Wednesday was his ninth consecutive game, the most he's played regularly this season. And first in that stretch with his familiar impact. "Obviously, it was tough going," Portis acknowledged. "Play four games, sit out 20, play five games, sit out six; kind of hard going back and forth trying to catch a rhythm. I feel when I first got hurt I was playing great basketball. I was scoring well, shooting the ball well, getting to the hole well, making my floaters. Now I'm just starting to get my feet back under me. "It was very frustrating," Portis acknowledged. "But I'm a guy who never tries to get too high or too low. I try to stay even keel. I always believe in myself, I always believe I can do the things I want to do. Just need other people to believe in me as well. It was tough, but I had good people behind me, good teammates, coaches, friends and family supported me and helped me get through it." 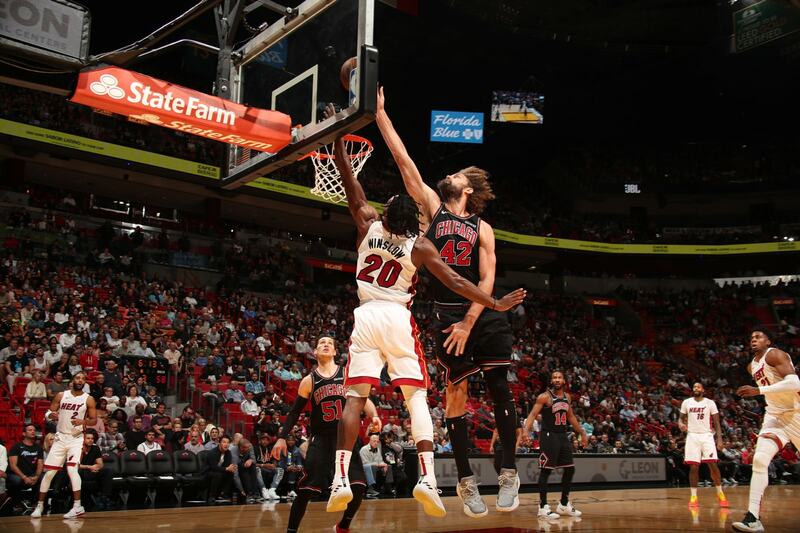 This wasn't one of those games it seemed like the Bulls could get through with the losing streak growing, the late arrival in Miami, LaVine going out after leading the team in scoring and assists again against Brooklyn, Parker ailing after a huge fourth quarter Tuesday and the starting lineup including undrafted Selden and Ryan Arcidiacono, and undrafted Shaquille Harrison as sixth man. Oh yeah, and undrafted Antonio Blakeney waiting to come in during the second quarter. Four of the top eight undrafted, on the road and second of a back to back with 14 losses in the last 15? Yes, the Bulls seemed ready. But that's also why you play the games, and the Bulls were better playing it than Miami, tougher, more determined and more skilled. The Bulls shot 51.3 percent overall and were a sharp eight of 19 on threes. Miami shot 38 percent. The Bulls had 13 fast break points to six for the Heat and had 26 assists with Dunn and Selden having eight each. Miami had just 36 inside points and were a woeful 18 of 42 in the paint against Bulls contests. "We won some loose balls," said Boylen. "We were hitting the boards and we were pushing up the floor. I thought our pace was good. I thought we did some things that we were practicing; our spirit was good. We're banged up and kind of limping into the break. Jabari had a bruised elbow and we weren't sure he was going to play, but he fought through and his minutes were valuable. Hopefully Zach will be back for Saturday (in Charlotte). It was a good team win." The Bulls had that encouraging start as Lopez quickly ran out Miami center Hassan Whiteside and a 10-2 close to the quarter. But there's generally this sense of unenviable inevitability with these Bulls. It's perhaps not the way to build a franchise, but there is something to playing those guys who are desperate to just be in the NBA. Brandon Sampson, one of the Bulls two-way G-league players and yet another undrafted player—yes, five in the rotation Wednesday—scored his first two NBA baskets to start the Bulls second quarter scoring after Miami came back quickly to take a 34-33 lead. The game rocked back and forth tentatively in the second with Miami pulling within 50-48 at halftime. Markkanen was being banged around like a billiard ball while trying to get position as defenses continue to gang up on him. The changing rotations kept him from finding easy shots with enough ball movement. But he kept throwing himself in there and wiped the floor more than the kids with the mops. "I could feel my legs really tired and the shots short," Markkanen acknowledged. "Glad we had guys to put the ball in the hoop today." The Heat with Dwyane Wade out with a sore knee, nevertheless, seemed poised to take the game in a script so familiar to these Bulls. No one expected a different ending. But the Bulls kept matching Miami's storyline, Selden and Dunn with mid third-quarter threes and then Portis starting to bang his way inside and to the free throw line late in the third. "First half I missed some shots I usually make," said Portis. "Second half, I came in, stayed composed. My teammates did a good job setting me up and giving it to me when I was hot." Dunn, especially, found Portis with a three on a drive and kick as the Bulls closed the third leading 78-68. And then left the Heat going down the drain in their own vortex of despair with that Portis fourth-quarter run. Bobby P with some pyrotechnics. Did Miami have a spark left trailing by 10 with 5:29 left? Selden drove and scored and Portis took off and finished a three-on-one after a Heat turnover, and Miami was toast. Selden added his fourth three-pointer of the game and it was the Bulls holding the ball at the end so as not to further embarrass the opposition. How's that for a surprise ending? "Accolades come with winning," said Portis. "We are not there yet. I'm just happy to be back playing."